The City of Calgary received an application to redesignate (rezone) an area of land directly beside Canada Olympic Park. The City of Calgary has received an application to redesignate (rezone) an area of land directly beside Canada Olympic Park. Development across the disturbed and undisturbed areas. Low density residential development within the natural undisturbed area (subject to further review of environmental constraints). Limit development to only the disturbed area. Preservation of the undisturbed natural area. Public access agreements to allow public use of the natural areas on the site. Additional residential density which would allow for residential buildings up to 5 storeys in height (a Floor Area Ratio of 2.5). 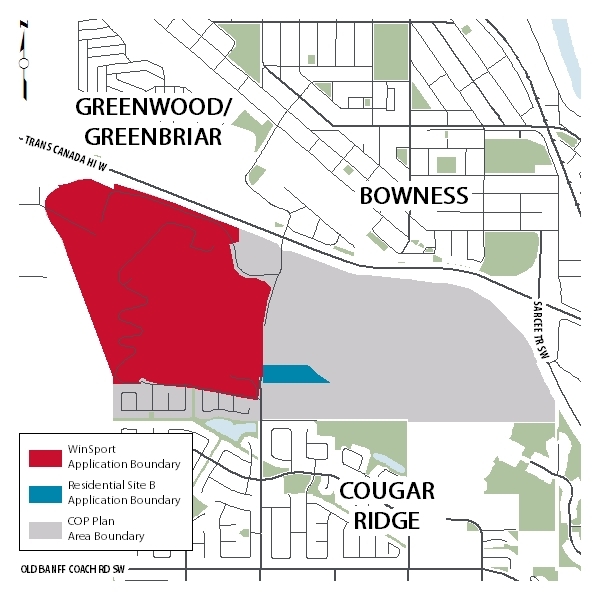 Specifically, the applicant is seeking to redesginate 3.1 hectares of land located off 85 St S.W. from special purpose future urban development (S-FUD) to multi-residential – medium profile district (M-2) and special purpose urban nature (S-UN) to allow for multi-residential units and the preservation of environmentally sensitive areas to be dedicated to The City. This opportunity for input is now closed. Thank you for your input. A What We Heard Report will be posted here once the feedback has been reviewed. The proposed land use could change several aspects of the property. Using the drop down menus below, let us know your top three priorities for consideration. Let us know why each of these priorities is important to you in the comment boxes below. What are your issues or concerns with this application? Please give special consideration to natural space, maximum number of units, traffic, view and residential versus hotel use. Do you have issues or concerns with the existing Area Structure Plan for this site, including the potential for a hotel development? What is a Land Use Redesignation? 1. Implement The City’s broad planning objectives of the Municipal Development Plan, the Calgary Transportation Plan, and other plans and policies by promoting logical, compatible and sustainable development. 2. Guide decisions that determine the form that the plan area will take as it relates to essential services and facilities, land uses, transportation systems, population, jobs and densities, and the sequence of development. Municipal Reserve lands are intended to provide suitable areas of land for the provision of recreation facilities for the use and enjoyment of the general public, as defined by the Municipal Government Act of Alberta. Municipal Reserve lands may also provide important access links to other lands, including water access, or offer undeveloped green spaces that act as buffers between different land uses. This application proposes to change the land use designation of this property to accommodate a development. In order to construct the development, the applicant would need to apply for a Development Permit that meets all the requirements of the land use district.